Doctors in the textile city prescribe inhalation therapy for asthma patients. In the past three decades, cases of asthma have increased in the urban areas in India. About, seven to eight percentage of the urban Indian population suffers from the condition. ‘Global Disease Burden 2016’ puts India next to China in terms of asthma prevalence and asthma mortality. COIMBATORE: About one-third of the out-patients pulmonologists see, suffer from asthma. While there is no data to substantiate the claim, doctors share that reasons for an increasing number of people suffering from the condition are high levels of pollution in our city, urbanisation and change in diet patterns. It is a myth that food allergy causes asthma, say the experts. “While only four to six per cent of patients suffer the condition due to food allergy, a majority of patients acquire asthma because of urbanisation," Dr K. Srikanth consultant pulmonologist at Sri Bala Medical Centre Hospital said. Doctors in the textile city prescribe inhalation therapy for asthma patients. There is no cure for the condition, doctors share that therapy can help keep it under control. “While inhalation treatment can play a crucial role in reducing the impact of asthma on people's lives, compliance is crucial. Inhaled medicines help to deliver the drugs directly to the lungs.” he said. “But we need patients to adopt the treatment as they are prescribed in order to get the full benefit. Inhalation therapy works to control asthma by preventing and relieving symptoms and reducing flare ups," Dr. Jay Mohan Unnithan, Consultant Pulmonologist said. #BerokZindagi yatra, a public service initiative of leading pharma company 'Cipla', is a national campaign which aims at curbing the social stigma associated with asthma. 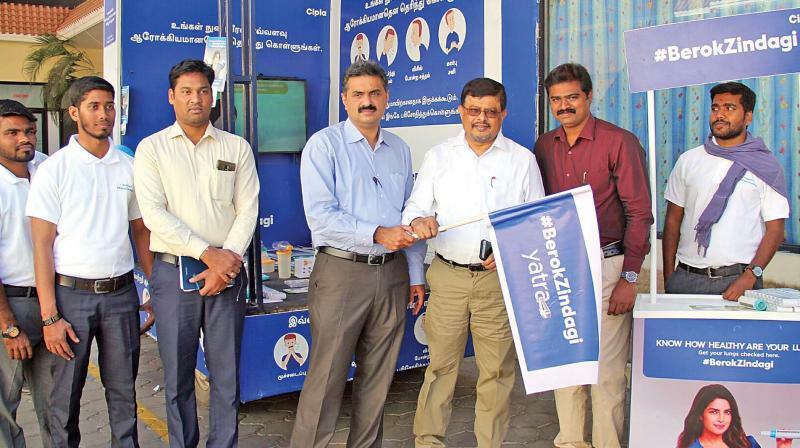 As part of the initiative, a mobile van equipped with educational materials to spread awareness about the cause, symptom, treatment and prevention of the condition is making its way to several districts of Tamil Nadu. The initiative was flagged-off by Dr. Jay Mohan Unnithan and Dr K. Srikanth. It will be stationed in the city till January 17. “The campaign aims to help millions breathe-free and is here to support asthmatics by encouraging them to opt for inhalation therapy. Shying away from the condition will not improve quality of life, accepting it will do. Asthma can be controlled with medicines, but without the appropriate treatment, it can lead to frequent attacks,” the company said in a statement. While striving to establish inhalation therapy as the smartest choice to combat the condition, the multi-channel initiative will also provide information and resources for people affected by asthma and healthcare professionals. The campaign also aims to eliminate the stigma around inhalation therapy and make it more acceptable, to help foster further dialogue.